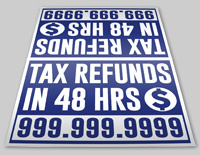 For larger orders, you can save hundreds, even 1000’s of dollars with polycoated cardboard signs. Available loose or pre-stapled/kitted. 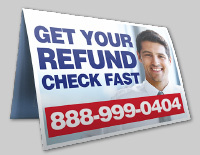 Poly coated cardboard signs fold over U stakes for fast placement. They are a great economy choice, holding up better in extreme weather than poly-bags, but not as well as corrugated plastic. They are outdoor durable from 3 to 6 months max. The thickness and finish is like milk carton, which is the name most often used for coated cardboard signs. 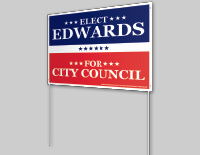 These are the economical, quality choice for quantities of 2000 to 10,000 signs. They can be printed either with silk-screen methods, or digitally for full color looks.